The Crowned Prince Eheneden Erediauwa will ascend the ancient throne of the Benin Kingdom as the 39th Oba in a colourful ceremony today Thursday, 20 October 2016. Benin Kingdom in Edo State is experiencing what could best be described as a new dawn as the new Oba of Benin prepares to ascend the throne. The Oba of Benin, or Omo N’Oba, Emini mini mini is the traditional ruler of the Edo people and head of the historic Eweka dynasty of the Great Benin Empire. The title of Oba was created by Oba Eweka I, Benin Empire’s first ‘Oba’, who is said to have ascended to power at some time between 1180 and 1300. The Oba of Benin was the Head of State (Emperor) of the Benin Empire until the Empire’s annexation by the British, in 1897. The centre and major streets in ancient Benin are wearing a new look. For the first time in over 900 years, the palace ground is being landscaped and adorned with glittering electricity bulbs at strategic places. All the major roads to the city centre had been condoned off since Wednesday. The Oba Ovoranmwen Square was closed to traffic and commercial activities around the Square have been prohibited while posters and banners of Prince Erediauwa adorned the streets. Crown Prince Eheneden Erediauwao, born in 1953, He has a B.A. in economics and sociology from the University of Wales, and a member of the Nigerian Institute of International Affairs. He served as a former Nigerian Ambassador to both Norway and Angola. Since 1987 he has been active in leading positions within the Nigerian business community, especially the gas and oil industries. 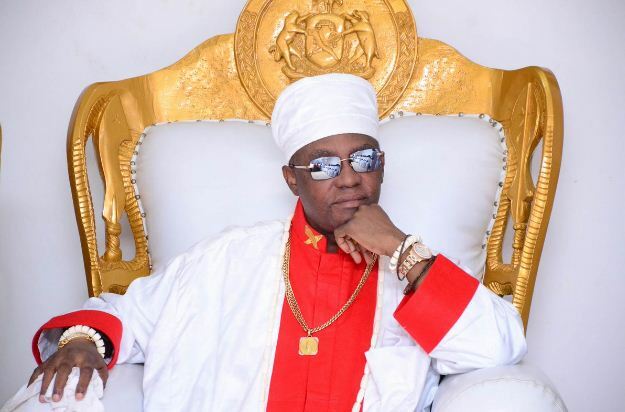 He was formally installed as the Edaiken of Uselu, Benin Kingdom on March 12, 2016, thus making him the next Oba after completing the traditional rites. Prince Eheneden is married to three wives: Princess Iroghama, (Obazuaye N’Erie), Princess Iyayiota, (Obazuwa N’Erie) Princess Ikpakpa (Ohe N’Erie). Already, Prince Erediauwa has played the Akhue game at the Ediaken N’Use Palace and chosen the name he will answer as the Oba. The name will be unveiled today at the presentation of the Staff of Office by Governor Adams Oshiomhole. Once the name is revealed, his children will also stop using Erediauwa in their names. The journey to the throne began in May when the Crown Prince trekked from Benin to Uselu in Egor Local Government Area after he completed the rites and rituals to get the title of Edaiken N’Uselu. It was while he was at Uselu he performed the funeral rites of his father. Prince Erediauwa has also visited some shrines in some villages where he will be forbidden to enter again once he is crowned. The new king was 25 years old when the late Oba Erediauwa was crowned in 1979. He will be crowned at a private ceremony inside the Usama Palace by the Usama N’ Ihiron, also known as Edion, led by Chief Oliha.